We hate to say so, but we saw it coming like a neon gourmand in the hands of a promotion lady at Bloomie’s. The reviews became shorter and less frequent, lost their star ratings, and eventually became terse bouillon cubes of condensed inanity, instead of florid frappés of nonsensical adjectives generously garnished with Francophonic name-droppings. Our ongoing BurrOmeter feature tracked the TNYTODPC’s diminishment. In the comments we chronicled our technical staff’s valiant efforts to tweak the BurrOmeter’s ability to detect the fading signal. The FirstNerve technical staff were pleased to fire up the BurrOmeter, but with the bite size reviews they couldn’t really redline it. Plus all the French name drops left a sticky coating on the sensor surfaces. It’ll take days to vacuum all the Polge particles out of the francophilia filters and swab the Ropion residue off the transthermal rhetorical coils. Nothing to it, really. Just had the BurrOmeter technicians boost the gain on the metaphor diodes and use a high-pass filter on the name drop dosimeter. With state-of-the-art automated rhetorical analytics, we should be able to get readings until the reviews drop below 20 words. We went to great expense to recalibrate the BurrOmeter to measure the new, abbreviated, star-less reviews. But the sample size is getting tinier and tinier—it’s now down to 40.8 words per review. And since each perfume is now paired with another in the same brand, it’s effectively 20.4 words. 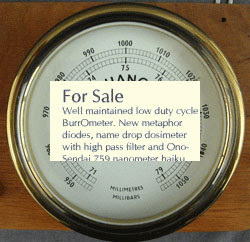 Shave off a few more and we’ll have to buy an Ono-Sendai 750-nanometer haiku demodulator for the front end. The FirstNerve technicians are triste, to say the least. In fact, they’re goddam désolé, having just been shown the door by HR. Well, all except Stan. We’re keeping him on to mothball the BurrOmeter for eventual sale. We’re looking for something just north of thirty large. We hope to find a new owner who appreciates its historical role. Hey! Maybe the Museum of Arts and Design will buy it. Should look great in their new Center for Olfactory Art. We’ve got an assload of Jean-Claude Ellena bobbleheads in the storage locker. Ten bucks each if you pay the shipping. Will we miss the reviews of Mighty Chandler? Thanks! I've marked you down for six bobbleheads. There hasn't been a lot of CB to miss lately. Plus, there's lots of better commentary to read beginning with your sultry self and including the winsome Katie Puckrik. KP needs a hotter medium than the Gray Lady; maybe E! network or Discovery Channel. My father was right when he lectured me on human waste floating to the top. Although I can appreciate CB wanting to bring fragrance into the mind of many... I'm not a fan of his approach. So Be It! He has an opportunity to do something good. Time will tell! As for KP..... hmmmmmmmmmmmm two words, Trite and Whimsical. I'm not inspired at all hearing from those who have never done. Critiquing without knowledge is becoming boring, confusing and lacking in the substance that is needed to be helpful in aiding one to make a fragrance decision. There should always be a counterpoint to an argument and KP's views are her personal taste. We already have an industry that continues to deliver for only 2% of the taste over and over again. Thanks for the laugh my friend... the first one today! place on a fence post in the open range, a more than suitable target for our gun enthusiasts. Maybe the solution is a Puckrik/Matts version of Siskel & Ebert. Hmmm.. now that could be interesting!